«©NCSX» Preorders for the 3DS Expansion Slide Pad are shipping today. Who would want a Slide Pad? Anyone who wants to slot his 3DS into a plastic platform which adds a second analog controller to the 3DS and play an assortment of game software which utilizes the pad. To be clear, none of the games that support the Slide Pad require the Slide Pad. However, game play is apparently improved when the second analog thumb pad is used. 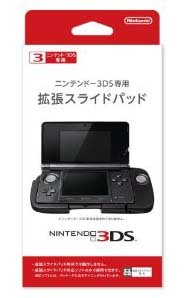 No physical port connection between the Nintendo 3DS and the Slide Pad is made when the 3DS is slotted into the accessory - the two devices communicate by way of infrared connectivity. Rubber molding on the inside of the Slide Pad's 3DS cavity ensure a tight grip but please note the Slide Pad covers the 3DS cartridge slot. Every time you wish to switch games, the 3DS must be lifted up and out of the Slide Pad. Nintendo could probably manufacture a 3DS that integrates the Slide Pad in the future and call it the '3DS-SP' but for now, the ungainly platform that holds the Slide Pad will have to do. A single AAA battery powers the Slide Pad and add a bit of weight to the integrated unit. All preorders are shipping today and new orders are welcome.